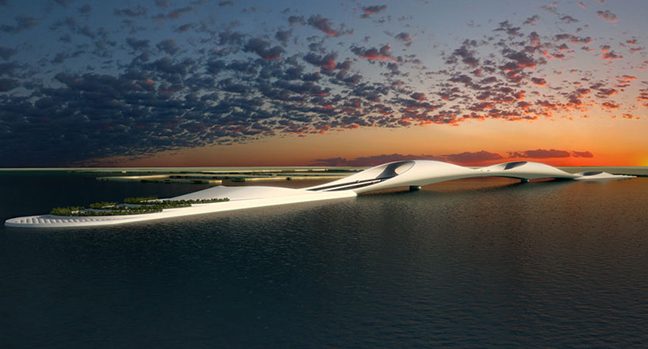 The Sharq Crossing (formerly Doha Bay Crossing) Masterplan has been developed by Santiago Calatrava at the request of the Ministry of Municipal Affairs and Urban Planning (MMUP) and features a unique combination of an efficient civil engineering solution and a highly iconic design. The Masterplan features a major traffic connection linking the Airport area with the West Bay Financial District and the Cultural City. Substituting the formerly proposed tunnel only system, Santiago Calatrava has designed a solution with a bridge at each of the three ends of the tunnel system. The connection of the bridges to the previously proposed traffic system follows the same principle at all three locations — a short tunnel underpass runs below the coastal district allowing the bridges to emerge offshore before descending beneath the sea to connect back to the main road tunnel. In this way, each bridge reads as an individual sculptural piece with distinct character drawing on the constraints of the adjacent urban environment. 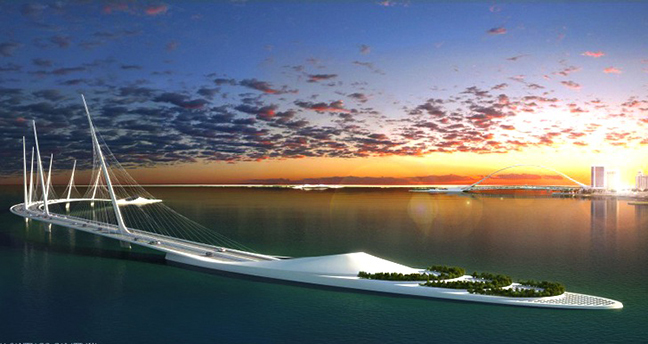 The conceptual design for the bay crossing is is steered by the following set of ideals: the Corniche‘s development as ‘the Corniche Park‘; an island ‘Crossing‘ as recreational facility, bridge ‘destination’ and ‘sub-surface road interchange’; the West Bay Bridge as a green extension of the ‘Corniche Park‘ creating bridges of international distinction; minimising the impact on the bay environment by designing bridges with a minimum number of supports; deriving a safe and sensible solution to the problems of crossing such an expanse of water with significant submerged tunnel portions.